After lunch, we met back up and headed off for another adventure in the Cirrus. 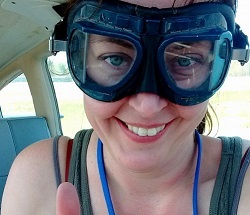 I got to fly left seat again and was told that at the conclusion of the flight – depending on how things went – I would earn my high performance aircraft endorsement. My life has been forever changed. Oh, and yes, I successfully earned my high performance aircraft endorsement! Since my flight home that night was a redeye, I was able to go out and explore Las Vegas for a few hours. I’m not really one for loud, flashy places, but I can see the appeal. Special thanks to the Bell Captain at Bally’s for helping to make my time in the city a pleasant one. Definitely a trip I won’t soon forget. This entry was posted in Aviation and tagged Adventure, airlines, Airplanes, Airport, Aviation, Cirrus, Cross Country, Flight, Flight Simulator, Flying, food, Grand Canyon, Happy, High Performance, Hoover Dam, Lake Mead, Landing, Las Vegas, Life, Living, Lost City, Love, monkey, Plane, SR22, Success, Sunset, Takeoff, The Narrows, travelling, Valley of Fire. Bookmark the permalink.